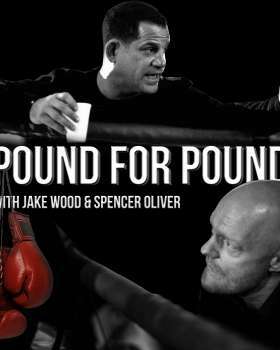 POUND FOR POUND is the explosive chart topping Boxing podcast hosted by Eastenders star Jake Wood and his best mate, ex European Super Bantamweight Champion Spencer Oliver. Launched in January 2018, each week Jake & Spencer are joined in the studio by top names from the sport & celebrity boxing fans. The podcast hit the #2 spot on Sports Podcasts within 1 week of launching and receives over 20,000 listens every week. The show has since topped the Apple Podcasts charts on multiple occasions. Besides Apple Podcasts & Spotify, you can also hear the podcast via IFL TV, the #1 Boxing Youtube Channel. Guests to date have included Eddie Hearn, Tyson Fury, Gary Lineker, Ray Winstone, Tony Bellew, Chris Eubank, Piers Morgan, Ricky Hatton, BAFTA winner Tom Davis, Nicola Adams & KSI.